I have bad eyes. I am short sighted. I have been wearing glasses ever since I was in school, around 7-8 years old, and was kinda labeled a nerd. Back then glasses were boring and lenses were thick..
So,what makes an ideal contact lens? Professional Service Manager of Vision Care, Bausch and Lomb Malaysia, Alice Tan describes the ideal contact lens as one that provides satisfactory visual performance, acceptable comfort, adequate corneal physiology, and ease of handling. comfort, convenience plus the user’s needs and lifestyle. 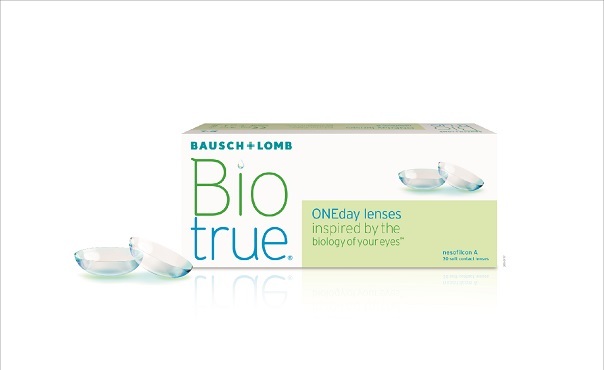 The Bausch and Lomb Biotrue® ONEday daily contact lens featuring revolutionary material Hypergel, has since been considered the ideal contact lens by many professionals and users alike for its winning qualities. When choosing a suitable contact lens, we really should consider the water content of the lenses as a higher water content provides good initial comfort... However, it does not necessary translate into all day comfort, as this generally cause dryness at the end of the day. 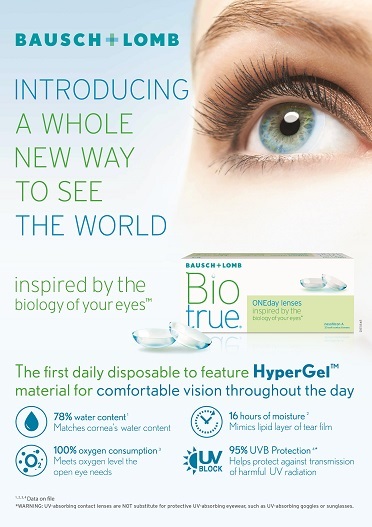 Biotrue® ONEday Daily contact lens is unique because it mimics the lipid layer of tear film to prevent dehydration thus provide moisture up to 16 hours, surpassing all major contact lens brand in the market today. Anyway, did you know that the cornea, the outermost layer of our eyes has no blood supply of its own.... Therefore, under the open eye condition, atmospheric oxygen is dissolved in tears and absorbed by the cornea. When one wears contact lenses with poor oxygen transmissibility, the oxygen supply to the cornea can be disrupted. This can lead to corneal swelling and if the condition persists, blood vessels can grow into the cornea and cause new blood vessel formation. These complications are common when we wear contact lenses to sleep, particularly with lenses that are not designed for overnight wear. And in general, overnight wear of lenses is more prone to eye infection and that is why sleeping in contacts are generally not recommended. 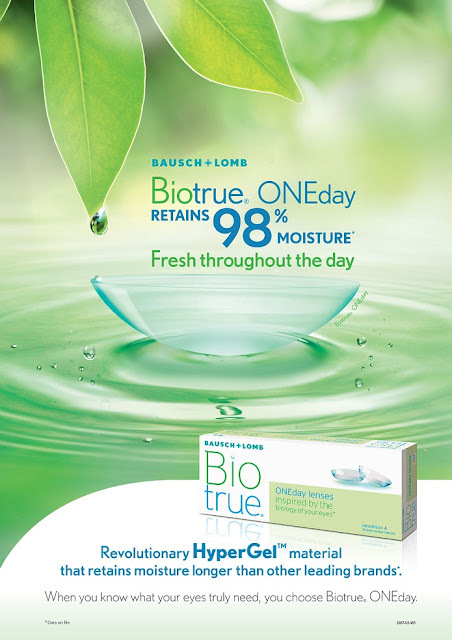 Above all benefits, Bausch and Lomb Biotrue® ONEday Daily’s Hypergel happens to be the first soft contact lens material that provides UV protection. It can block 70% of UVA and 95% of UVB radiation. However, we really should not forget wearing sunglasses for better protection. Unlike Other Contact Lenses, They Work Like Your Eyes. For Comfortable Vision throughout the day. I love the brand so much. I wearing biotrue.